Did you know that the German word for “queen bee”, Weisel, is a masculine noun? Yes, that great animal world icon of matriarchy… is masculine. Nicole told me this odd factoid the other day as she studied a German language book. One thing we were very aware of on our recent trip to Austria was our poor German and so Nicole is very keen to improve. She speaks it better than me, but we still lacked enough to hold more than a basic conversation with folk, and were embarrassed by the fact that nearly everyone we met in Austria spoke impeccable English – including one waiter in a cafe in Graz who replied in English to everything we said to him in faltering German. German’s a funny language. I genuinely think it is sounds lovely, and this was confirmed by a concert we went to in Graz of the Styrish youth choir, who sung some hauntingly beautiful masses and chants in German as well as Latin. But it isn’t half complicated. And in fact German shares a lot of the cases that made Latin the bane of schoolkids a generation or so ago, with the articles (the words for “the” or “a”) changing according to where in the sentence a word appears. I found this unnecessarily laborious when I learned German at school, and still do. 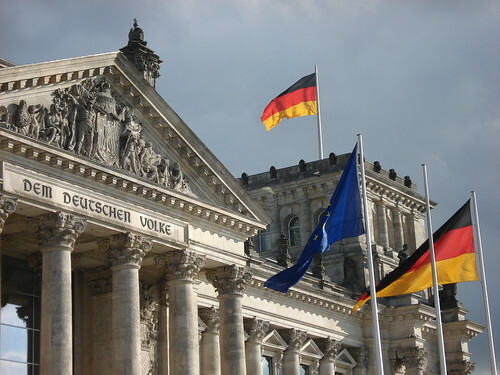 One example is the photo above of the Reichstag, the historic parliament building in Berlin. On it is written: “Dem Deutschen Volke” – not “the German people” as you might think, but “for [or to] the German people”. Depending on the gender of the noun and its position in a sentence, the word for “the” in German could be der, die, das, dem, den and no doubt others I’ve forgotten. An unnecessary complication if you ask me. Although we have some stubborn case changes persisting in English (such as the difference between “him” and “he”), we’ve swept most of that pointless complexity away, and as such it is hard to comprehend the phenomenon other languages. Even our friends’ toddler-age children in Austria seemed to have got their heads around cases, putting us doubly to shame. It’s not just cases, of course, but genders. Getting my head around the idea that some nouns are masculine and others feminine was difficult enough in French, but then to be confronted by three in German was just mind bending and illogical. It wouldn’t be so bad if there was some consistency of predictability in the gender alignment of nouns, but if a queen bee is masculine and the word for “girl” (das Mädchen) is neuter, then you rather defeat the potential benefits of having genders. There is one feint advantage, though – you can reduce the size of your vocabulary by doubling up meanings. “Der Otter” (a masculine noun) is an otter, but “die Otter” (feminine) is an adder. Efficient, but confusing. Apart from the association of women with violence, I can see some of the sense – albeit that the catch-all “miscellaneous” class seems to hint towards a strong argument for not bothering with genders (or noun classes) at all. However, what is most amusing is that the same Wikipedia article goes on to tell us that in Dyirbal “aeroplane” is in class 3, on the grounds that it’s a mode of transport like a canoe which, made of wood, counts as an edible fruit or vegetable. That is stretching logic across a chasm that needs not exist. Such bemusing grammar casts my mind to a book I have somewhere in the house entitled “Teach Yourself Esperanto”. I don’t speak any Esperanto, but admire what the language tries to do and how it does it. Free of genders, cases or irregular verbs, the language’s basic rules are very easy to grasp and then never bent or broken by exceptions. It stands as an example of how simple communication can (and should) be. Maybe I should be inspired by Nicole’s attempt to take up German again by studying Esperanto seriously. Either that or it’s time to start a campaign for a gender- and case-free German. Though I suppose such a thing already exists: it’s called English. I’ve used Esperanto for many years, and I recommend it. Esperanto does have an accusative case, by the way, mostly used to indicate the direct object, but you are right that it is free of unnecessary complications. Thanks for the pointer Bill – though the website’s rather early 90s web design is extremely off-putting! English has just one class of nouns. French has two (masculine & feminine). German has three (masculine, feminine and neuter). You’d love Swahili. It has eight. Eight!? A language that has more noun classes than there are dwarfs in Snow White really is a silly language. This has lead me to some rather interesting reading on noun classes. I’ll take care next time I eat a raspberry.